Gap free data helps you create and manage high-performing applications that deliver flawless end-user experience and customer loyalty. To be gap free, you must capture data from every single method in your application infrastructure, end-to-end, including timing and code-level context for all transactions, services and tiers, and make the data available for analysis. 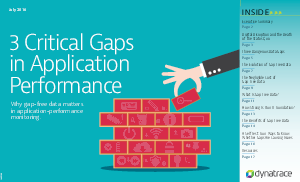 This eBook gives you technical and business case details that will show you why gap free data is a critical part of your application management strategy.